Image courtesy of crooked lines. At the close of his poem ‘Autumn Fragment’, Kaiser Haq asks: ‘Can one write / Verse that is free of ambiguity?’ A more pointed consideration for contemporary writers hailing from Bangladesh is whether perhaps one should. Ambiguity is a comparatively safe stance if you happen to be a progressive political-bloc affiliate or a moderate Muslim of the Tagorean cultural set: anything other than ambiguity might potentially imperil your life. The use of ‘potentially’ is deliberate, for it is undoubtedly reductive of Bangladesh’s complexities to characterise a country only through the tragic number of secular writers, publishers, activists and intellectuals murdered in recent times for challenging, in the interpretation of Islamist extremist groups who later claimed responsibility for many of the slayings, certain (conservative) socio-political and religious ideals. With the assassination of writer and publisher Shahzahan Bachchu on June 11, during this year’s Ramadan, Bangladesh is becoming a noticeably volatile place for those who confront, ambiguously or not, the darker strands of tension intersecting the country. Years ago, a friend in Dhaka made clear the severity of the divisiveness concerning identity and affiliation in Bangladesh: ‘If you are wrong, you might get killed.’ In the current context – not the only devastating surge of violence the people of Bangladesh or Haq himself, as a veteran of the Liberation War of 1971, has experienced – this is not an aggrandised statement. Despite the blurb of the second edition of Haq’s Pariah & Other Poems (Bengal Lights, 2017) claiming he deals with ‘everyday … social and political problems’, the poet’s own words convince further. Seasoned, erudite and ironic, Haq’s poetry reaches across the beauty and devastation of memory; progress and ageing; death and loss, and the deterioration of people, community and the recognisable ‘home’. In Pariah & Other Poems, instances of activism are cast under the glaze of reminiscence: ‘I remember, I remember so well / My first protest march on a broiling summer day’ (‘Barbecue’). In the course of a restive morning, the speaker ‘blinkingly’ reads in the newspaper of a ‘poet’s retraction / Of satirical verses’ (‘An English Sonnet = 140 Syllables’). In ‘Kabbadi with Death’, written after the murder of Dhaka tailor Biswajit Das by Chhatra League activists, the speaker wearily abandons question marks: ‘What happens to the ash / From burnt young flesh / Disinfected of politics’. Just as poetry’s ‘helpless lines’ are acknowledged in ‘Kabbadi’, in ‘Getting it Right’, words are ultimately deemed inadequate weapons: ‘… in prose or verse / It’d come out the same: / Day 9 of blockade, / Eight more dead’. Elsewhere, Haq admits to ‘unwittingly’ making himself a ‘cultural pariah’ by claiming ‘the language of the erstwhile colonial masters’ when commencing to write poetry in English during his school years (‘Testament of a Pseudo Translator’). Haq does not offer up his method of survival. By adapting his words to title our conversation, I imply an alternative to the pariah’s ‘untouchable’ status – one that is neither pejorative nor heroic, but bound to observation, finely-tuned irreverence and a knowing eye for the effects and aftereffects of change, rather than its definitive cause. In January this year, during one of my regular visits to Dhaka, I spoke with Haq in his office at the University of Liberal Arts Bangladesh, where he is currently a professor of English. During the eleven years since our first meeting, Haq’s generosity is undiminished – matched, this time, by the motley, evocative clamour of traffic along Satmasjid Road, pressing against us as we talked. Kathryn Hummel: You’ve written that you have developed a taste for precolonial Bengali literature after working on The Triumph of the Snake Goddess (Harvard UP, 2015). What draws you to these texts? Kaiser Haq: An abyss separates modern Bengali culture from precolonial. Students studying Bengali literature hardly delve into precolonial texts. The focus is on colonial and postcolonial – modern Bengali –but the precolonial culture is still alive in the countryside. These traditions pre-date colonial power, though everybody left when the Brits started taking over. Story-telling, performances, these are marginalised and if you categorise something as just ‘folk’, you’re also marginalising it. It’s there for our amusement when we feel like it; it’s not a part of our modern cultural life. And that is what I want to sort of change, in my small way, by presenting some of these stories in modern English so that everyone can read them and find something. There’s nothing to prevent one from entering that world packaged in the way I got [The Triumph of the Snake Goddess] published. I’m not translating, I’m retelling. These old texts are in verse and I don’t want to do verse novels – they’re in prose. KHaq: I consider it history [laughs]. Throughout the sub-continent, English writing has been there since 1780, when the first book was published. Not so much in Bangladesh, but in India, you have a large number of people who belong to the intellectual and cultural arena who know English better than their mother tongue. KHummel: But knowledge of English is class-based here, right? People go to Bangla-medium schools or English-medium schools. KHaq: In Bangladesh it is. In Bangladesh, even knowledge of Bengali is class-based. Because the Bengali that you hear people speak is the demotic Bengali of all the different dialects of the districts. The literary Bangla which you’ll hear on the television, perhaps, or which is written in literary magazines or literary supplements in newspapers is something that a very small percentage of the people really know or are familiar with. Education is class-based now. KHummel: Who is writing in an accessible Bengali here? Is anyone writing in modern, informal Bangla or in that kind of style? KHaq: That has a place in dialogue but the narrative and descriptive prose is Standard Bangla. Some of the films feature informal Bangla, because film is entirely based on dialogue. In fiction it always comes in as dialogue or if it’s a first person narrative when the point of view is from a person who speaks only that dialect. We have this problem in every language – how to bring in the regional, class-based dialect. KHummel: While I’ve been in Dhaka I’ve been thinking about Shahbag and the changing political significance of the neighbourhood since before the Liberation War until contemporary times. After the 2013 protests against the leniency shown to Liberation War criminals, many of my friends who go to Charukola [Institute of Fine Arts] at night-time say it’s changed significantly because of greater government presence. I know Shahbag is the site of the murders of publishers and writers as well. You write fairly, what one might classify as, secular work. Have you ever had any death threats yourself? KHaq: I haven’t written anything condemnatory of religion. KHummel: But of politics, it seems you have. You wrote ‘How Many Buddhas Can They Destroy’ after the 2012 burning of Buddhist temples in Cox’s Bazaar and that was anti-fundalmentalist; would you also say, anti-government? KHaq: Well, yeah, but that kind of thing I think doesn’t put the extremists’ backs up. KHummel: No? So what would? KHaq: It began with the bloggers because the internet is a battle ground now. The religious right has been very quick to adapt to the internet and use it for propaganda purposes, as you know, a lot of the Islamic State recruits were seduced by things on the internet. So the secular bloggers then began to challenge those: this is the background. I haven’t read any of these blogs but apparently there was this running battle going on between the fundamentalist blogs and the secular blogs. KHaq: Well, the bloggers, a lot of them then published books. KHummel: From what I understand, Dipan published a range of texts including secular ones, but it was just because he was open to all perspectives that he was targeted. KHaq: He was killed there. KHummel: In Aziz Supermarket, yes. KHaq: Another publisher, Ahmedur Rashid Chowdhury Tutul, of Shuddhoswar Prokashony, was attacked and survived. Not far from here, in Lalmatia. 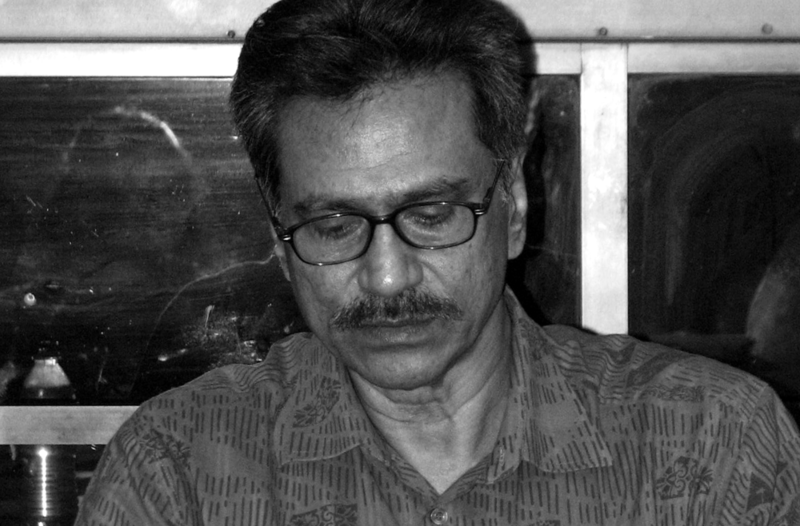 KHummel: Is your poetry, then, becoming more responsive to contemporary politics in Bangladesh? KHaq: I don’t think so. Contemporary politics in Bangladesh is partisan politics – which I don’t support. It’s very difficult to even formulate political questions in a literary context without being at once placed within that bipartisan framework, isn’t it? KHummel: I’m not referring to directly responding to whatever is going on in parliament but just the state of the country, which has always, I think, been your concern? KHaq: It doesn’t come in. I don’t think it’s direct. It’s in a state of flux. There’s little disturbances going on all the time and to get a handle on that you have to, sort of, write with purpose and that hasn’t yet happened. What I see is that this is a society that is changing very fast and it used to be very political. Now I think homo politicus has been replaced by homo economicus. People are just concerned about their livelihood, their careers, their earnings and they don’t want politics to disturb that. KHummel: Do they want literature to disturb it? KHaq: Literature cannot disturb it, it can only comment, describe, transform into an aesthetic form the objects of criticism, of literature and art in bourgeois society – and when you’ve homo economicus you end up with bourgeois society. KHummel: Does that interest you? KHummel: But then you’ve gone back to your medieval texts. This entry was posted in INTERVIEWS and tagged Kaiser Haq, Kathryn Hummel. Bookmark the permalink.